It is a common misconception that you need to be completely asleep and sedated in order to be intubated. That is patently false. 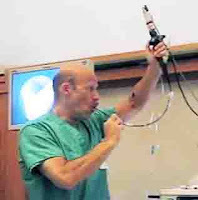 This little-used technique is a very important skill to have because in certain dire situations where a patient's breathing is compromised due to upper airway swelling (whether from infection or mass), attempted sedation and intubation may result in airway loss and need for emergency tracheostomy. At worst, death may happen. In such patients where there is airway compromise, awake intubation needs to be performed.